Every morning I say, 'this is going to be the best day of my life.' The moment you say that this is going to be a good day, thats when everything opens up to you." On a rainy spring afternoon in Manhattan, Täo Porchon-Lynch, the world’s oldest yoga teacher, walked into the Rubin Museum in a pair of high heels and asked for a glass of wine. She removed her black cape to reveal a Fendi scarf loosely draped around her neck, a stylistic emblem of her French heritage. A well-tailored knee-length skirt showed off an impressive pair of trim legs that only 90 years of yoga and a lifetime of dance could help shape. Perhaps the only visible evidence that the fashionable matriarch who had arrived was a yogi was the large silver amulet depicting Ganesh that hung over her heart and travels with her everywhere. She took a seat in the museum's café next to her friend, the photographer Robert Sturman. They exchanged hugs and swapped stories as Malbec flowed generously. "Anyone can be filled with beautiful ideas, but we must put them into practice. that's what you materialized with your photographs: you bring in the beauty of the world everywhere." Täo, who turned 99 this past August, is no average yoga teacher, nor does she fit the mold of a soon-to-be centenarian. She became a competitive ballroom dancer at 87, and appeared on “America’s Got Talent” in 2015 with a partner 70 years her junior. They performed to “Fireball,” a racy number by the rapper Pitbull — a testament to her modern edge. Täo believes there is no such thing as age and that anything is possible; she also prefers wine over water. Her thirst for life might very well be her secret to the fountain of youth. Täo has been practicing yoga since her childhood in Pondicherry, a French colonial settlement in India at the time. “When I was very young, I saw a lot of little boys playing a new game on the beach and I asked if they would let me join them,” she said in an interview. That game, according to her aunt and uncle who raised her, was yoga, and it was not normal for girls to partake. But the eight-year-old Täo was persistent, and she partook anyway. In 1930, when she was 11, she accompanied her uncle, a student of Swami Vivekananda and a friend of Mahatma Gandhi, to join Gandhi in a protest march. Born Andrée Porchon, Täo was named by her nursemaid in India because she was always brimming with the energy of nature. During World War II, they left India together in an attempt to locate Täo's father. They arrived at a family vineyard in the South of France, where her father's sister, a member of the French Resistance in Marseille, lived, worked and hid expatriates. There, Täo was asked to shed her saris in exchange for Western clothes, out of fear that the Nazis were watching. When they were nearly caught they fled the vineyard; Täo and her ayah were put on a fishing boat to Paris and another boat to London, just prior to the Nazi bombing attacks there. Täo got her first job as a dancer in a nightclub and then a cabaret, which led her to some of the top clubs in the city. Eventually she went back to France, becoming a model for brands like Chanel and Lanvin, which led her to New York City. Determined to break into show business, she took a bus to Hollywood with a list of contacts she'd met in the London nightclubs — one of which was the founder of M.G.M., where Täo came under contract and earned smaller parts in movies. With encouragement from Indra Devi, who knew Täo as a girl in India, she began teaching yoga to Golden Age actresses like Debbie Reynolds and Kathryn Grayson. Täo's French-Indian accent prevented her from landing bigger roles and she became frustrated with acting, shifting her focus to screenplays and documentaries. For years, she continued writing, producing and modeling, but was also committed to her yogic studies, traveling to India to study with B.K.S. Iyengar and Pattabhi Jois. In Hollywood, Täo was under the tutelage of her guru, Swami Prabhavananda, with whom she studied meditation until his death in 1976. Meanwhile, she met and divorced the self-described love of her life, Yvan Moynet, a French fighter pilot who relocated to Uruguay. It was heartbreak that steered Täo away from the glamour of Hollywood to focus on yoga and meditation. A journey that returned her to New York where she married her second husband, the late Bill Lynch, and settled in Westchester County where she teaches yoga to this day. Täo's work has put her in front of some of the biggest spiritual thought leaders of her time. In 2011, Täo earned the respect of His Holiness the Dalai Lama, when she sat on the Panel for Peace. 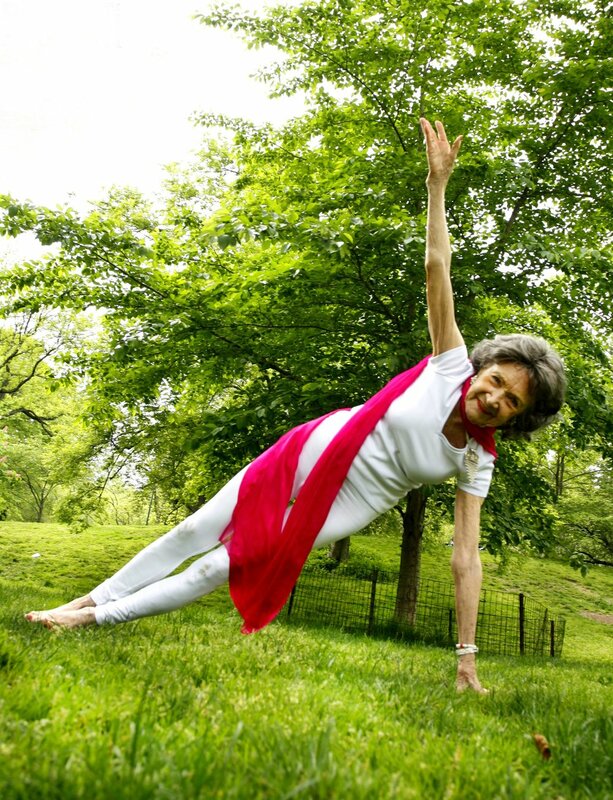 A year later, she was recognized by Guinness World Records as the “Oldest Living Yoga Teacher.” In 2015, she received an award from the United Nations for her leadership as a female entrepreneur. Her autobiography "Dancing Light: The Spiritual Side of Being Through the Eyes of a Modern Yoga Master" was published that same year. Since that first shoot, Täo and Robert meet in New York City once a year to make art together. This time at the Rubin Museum, it would be for the cover of a magazine, a first for Täo, despite that she is known far and wide as a Grand Dame of Yoga. Reunited, they took the stage and discussed the many ways in which the essence of yoga lights up the world.
" I think there's a way to experience life so deeply and so presently that when you photograph it, you just press the button once and walk away — and you don't have to question whether you missed it or not. It is effortless..."
The following is an edited excerpt from that conversation. RS: I’m always looking for good stories. I knew in the moment that we met that yours was a story worth telling; one that gives us hope and makes us want to be here and live life to the fullest. In a time where there is so much darkness and trouble in the world, people are hungry for great stories like yours. TPL: I agree with you that there is so much anger around us for no reason. The mind always brings out the problems! Don't spend your time thinking what you cannot do. Don’t let your mind take over — let your heart take over. It’s something that everyone should learn: never procrastinate. One minute after midnight it’s already today, so don’t spend your time wasting it! This is a precious gift we’ve been given. Vivekananda said, ‘don’t say I’ll do it tomorrow. Never say that there’s only one religion. Know that within us is the open door to attaining oneness with the whole world.’ This was something I always believed in. People do a lot of talking, but it’s action that matters. Robert, you not only take action, but your photos represent what I believe in. You open up that door with photography, and it doesn’t matter where you’ve been in the world — it comes to life. RS: When I forget about everything and I’m just in the moment creating, that’s when that oneness just happens. It speaks through me, and there’s no thought about it — it just is. I think there’s a way to experience life so deeply and so presently that when you photograph it, you just press the button once and walk away — and you don’t have to question whether you missed it or not. It’s effortless — and that’s how it is whenever I’m working with you; it’s never a struggle to create something. When art is created, it’s just the natural expression of a life that’s being lived. TPL: Well you certainly help bring it to life! You inspire me all the time. Whenever we come together, we experience that oneness. It’s easy to look and see a beautiful scene of trees, but it helps when someone can point out the very essence behind it. The American-Indians used to put their arms around the trunk of a tree and feel the energy of the sap moving up in there. We have that same thing within us — if we are in tune and just listen to our hearts, it opens the door to our whole being; it makes everything come alive. I know that nothing’s impossible — that there’s nothing we can’t do in life. If in this world I can make a little bit of difference, that’s what’s important. Every morning I say, ‘this is going to be the best day of my life.’ That’s when everything opens up to you. Other people are looking for that, but they don’t always know how to find it. This is the jewel of life: to awaken and know that nothing is impossible. RS: To me, being awake is knowing that we’re only going to be here for a brief moment, and being present to every person I work with because it could be the last moment that we have. Sometimes I’ll work with somebody and it will be their last picture — they’ll die the next week, making me realize that it is all just going to expire. Being awake is just being so grateful for what we have now, and knowing that working through your heart and being in touch with your heart is the most sophisticated tool we have. TPL: I don’t spend my time thinking of how I’m going to do something, because if I just sit around thinking then nothing is ever going to come. When I tune in and listen, I can feel that connection, that oneness — particularly with children. Children open up that the door to people — they don’t spend their time getting angry that they can’t do something. If I can’t do something, I’ll just decide that there is another way to do it. My uncle taught me to never look down on anybody — that there is always something good inside of them and you should try to draw it out. Don’t waste your time on things that are negative — open your heart to positive things and the whole world will come together. RS: Whenever I think of you I just know that things are going to be okay. There’s something about you that makes life worth living, and that’s the story that I want to tell in all the work that we do together. We are so blessed to share our story with NY YOGA + LifeTM, and celebrate you on the cover of the magazine. TPL: Thank you, that’s very special. I just hope I can live up to what you believe in. RS: And how long are you going to live? TPL: Oh at least 100... I have to live to 100! I have a lot of things I still want to accomplish, and so I better start working at it now — no words, just action. Every morning when I get up, I look outside and I witness the beauty of the birds flying around. Everything has energy within it, and all we have to do is bring that into play. I’m just spending my time making sure I’m doing everything that I believe in. Anyone can be filled with beautiful ideas, but we must put them into practice. That’s what you’ve materialized with your photographs: you bring in the beauty of the world everywhere.